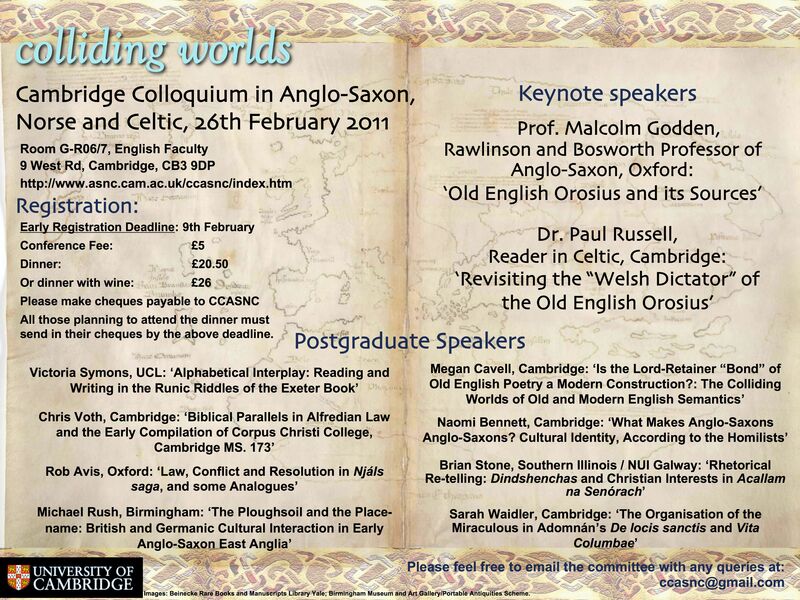 The Cambridge Colloquium in Anglo-Saxon, Norse and Celtic (CCASNC) was held for the first time in 2000. It is organised by the graduate students in the Department. A plenary paper is given by an invited speaker, generally from outside the University, and shorter papers are given by graduate students from Cambridge and elsewhere, on the designated theme. The proceedings are published in Quaestio Insularis. CCASNaC is an annual colloquium run by a committee elected from the postgraduate community in the department of Anglo-Saxon, Norse and Celtic at the University of Cambridge. Initially focusing on the literature and history of the early mediaeval British Isles and Scandinavia, CCASNaC has, as it has developed, come to include papers on the all aspects of the early Insular world, including material culture, theology, palaeography, art history and musicology. The papers given at CCASNaC are published in the proceedings journal, Quaestio Insularis, which also publishes the paper of the colloquium's keynote speaker (usually a renowned scholar in the field). Copies of Quaestio Insularis are available from the department of Anglo-Saxon, Norse and Celtic. The call for papers for CCASNC 2019 is now closed. Registration for CCASNC 2019 is open! Please click here for the programme and dinner menu. The conference will be held on Saturday 9th February 2019 in room GR 06/07 in the Faculty of English, and will be followed by a formal dinner at Selwyn College. The keynote speaker is Professor Karl G. Johansson (University of Oslo). The registration fee is £5 for undergraduates and £7 for all other delegates. The dinner will cost £39 with a £5.76 supplement for alcoholic beverages. Please note: if you wish to attend the conference dinner, registration must be completed by the 24th January. In order to register and pay for the conference and optional dinner, please click here.